The future collaboration mobile APP between Dentists and Dental Technicians that allows communication in real time! Digital Case Specifications that can be immediately shared with the technician. Miiosmile simplifies the workflow between the Dentists and Dental Technicians providing essential features such as: one-to-one collaboration, easy networking tools (based on location), integrated photo protocol, personal assistant (tasks & events), in app chat, advanced dental job tracking, patient case history and so much more. wich case management and production tracking. Login to miiosmile+ to customize your dental laboratory. Create production stages, add employees, associate technicians for each production stage, production cases tracking. 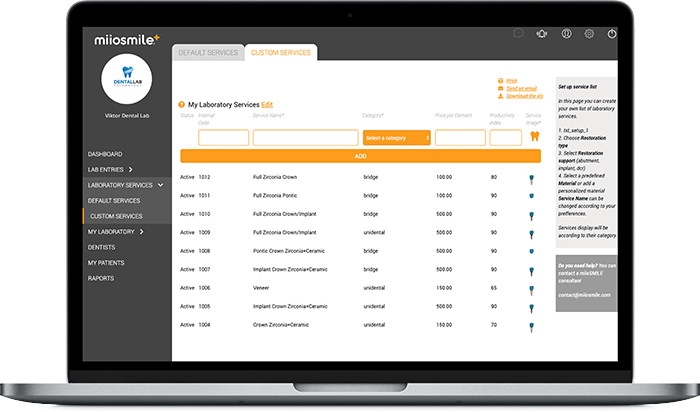 Create custom lab services and allows dentists to send prescribe restorations according to the services your lab provides. Unified communication App/ web platform for dentists and technicians reducing cluttering. Advanced dental design case with multiple restoration features. Based on the colour code the dentist knows the progress of each dental restoration. Using the notifications system the technician sends the status of the work to the dentist. Easy to access pacient’s history case details. Easy adding photos in patient lab sheets/rx allowing technicians to follow accurate facial anatomycal treats. Secured data transmision between users. 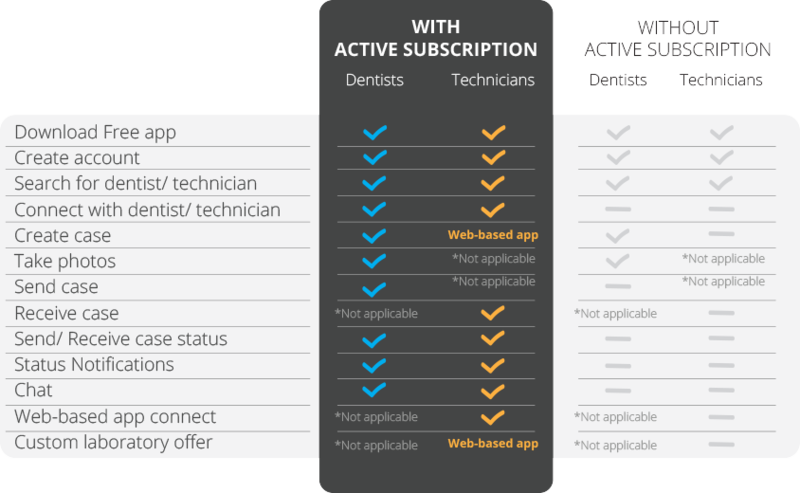 In-app messaging provides two-way communication between dentist and technician. In relation to each dental work there is a messenger channel. Text or images can be sent. Print the lab sheet with all the job specifications directly from your mobile device. Discovery & instant connect doctors and technicians. For customers who are subject to the requirements of the Health Insurance Portability and Accountability Act (known as HIPAA, as amended, including by the Health Information Technology for Economic and Clinical Health — HITECH — Act), Google Cloud Platform supports HIPAA compliance.